The cover image is taken in central Staffanstorp, the small town where I live, at a roundabout close to the bus station. 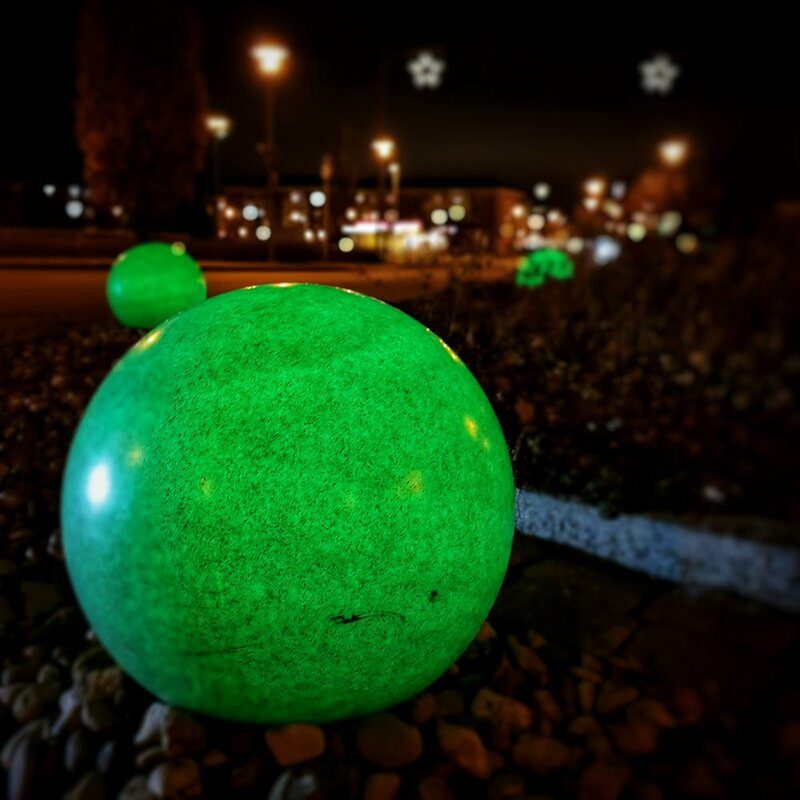 These orbs shine in different colors throughout the year and I've photographed them with my cell phone before, but I figured I'd try the built-in selective focus function in my new Galaxy S8 Plus to get that blurry background I am so used to from my "real" camera. I am sure I drew a few curious looks from cars going past me as I was hunkered down to take this picture, with my rear end almost out in the lane...but that's pretty much normal for when I am out and about photographing, so it doesn't bother me too much! I pretty much have to have the first image of the year in a post like this now, don't I? This picture was taken at the Gamla Stan ("Old Town") subway station in Stockholm. I had the privilege of visiting that city over New Year with my much, much better half and we both enjoyed the stroll through the medieval parts of the city. I liked the backlit silhouette of the other passenger waiting for a train and I emphasized this with my postprocessing treatment by turning it black and white, making the many different colors in the original more uniform. This is another experiment with the selective focus function in the Galaxy phone, where I focused on the locks and via the built-in software got a blurry background on the very familiar houses of Nyhavn in the background. I was there, showing my American guest the beauty of Copenhagen and we definitely enjoyed Nyhavn, even if it got VERY cold to take the boat tour of the city in the late afternoon! 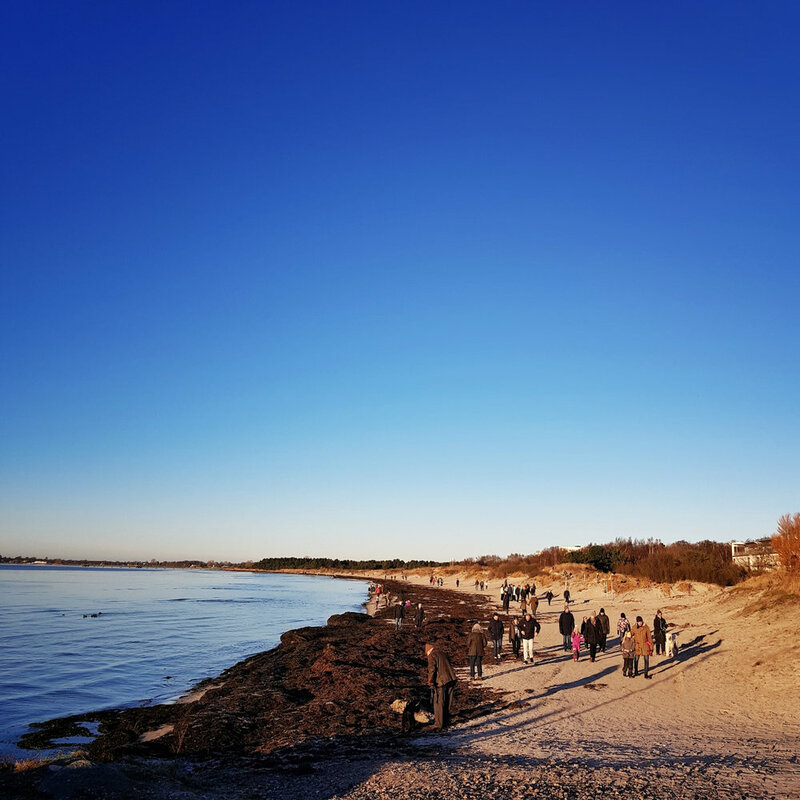 This picture is taken at the beach of Lomma just outside Malmö, Sweden on a Sunday when the sun actually did shine a bit...something extremely rare during the month of January. Just about everyone seemed to have had the same thought...time to enjoy a seaside stroll in the sun. It was a lovely, if somewhat crowded, walk that day. A few Christmases ago my significant other, who spoils me with gifts, got me a lens and accessories kit for my phone photography. One of the lenses in the kit was a macro lens which I haven't really used much (because I didn't like the way the images looked on my old LG G4). I figured I'd give it a go with the new phone, because my 365 project is all about taking pictures I haven't taken before...or attempt to at least! This is a very close-up shot of a stack of coins where the lens was just millimeters from the stack, and I had to use a small tripod to make sure the focus was reasonably steady. Sometimes you look out the window and see a boatload of fog and think "Cool...I gotta take pictures of this!" So that's what I did at a nearby renaissance castle that I have been to if not thousands of times at least hundreds; Torup Castle. This pair of swans swam around in the old moat but kept their distance almost the whole time I was wandering around, right until the end when I got close enough to have them in the frame with the reflection of the castle in the water. I took a lot of pictures that day and I have no doubt that some of them will show up in my 365 project on days when I haven't taken a picture and have to dip into my archive for a daily picture.